Do you remember the movie Shakespeare in Love? Won five Academy Awards? I happened to catch it on Encore recently. Having been so immersed in Shakespeare’s world the past few years as I worked on Kissing Shakespeare, I watched it with a new appreciation. I’d already seen it, of course, but this time, it meant so much more than when I first saw it in the theaters. Like many of the Bard’s comedies, it has a bittersweet ending. The only fault I found with it was Gwyneth Paltrow’s false moustache and goatee. She doesn’t look the least bit like a man; she just looks, well, silly. But otherwise, I loved the romance, the humor, and all the funny bits about how Shakespeare got ideas and inspiration, especially as he works on the current production of Romeo and Juliet (working title, Romeo and Ethel, the Pirate’s Daughter), with Viola (Paltrow) as his muse. When Viola sails off to Virginia with Lord Wessex (Colin Firth), her new husband, the clever foreshadowing of the plot of Twelfth Night helps us to get over the separation of the two lovers. Gwyneth Paltrow deserved the Oscar for her role. She’s luminous. 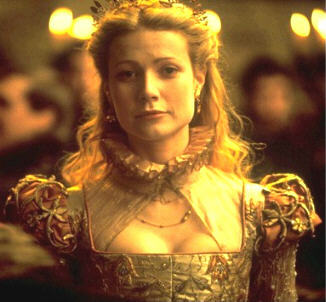 Her face is a palette of emotions, and she positively glows in Will Shakespeare’s presence. Interestingly, Shakespeare’s marriage to Anne Hathaway is only mentioned in passing. The audience very much wants to believe that if not for the pesky Lord Wessex, Viola and Will could live happily ever after. Too much emphasis on the fact that Shakespeare was in fact already married would certainly have gotten in the way of that! This is one of my favorite Shakespeare-themed movies. Do you have a favorite? Hi, Pam, As promised, I’m here. How delightful to have a writer among what looks to be a group of visual artists. Hope you enjoy the class. Have you had a chance to look at our fellow artists? Pam, I worry that my comment appeared instantly without having to be monitored. I say that because I get at least three spams a day; fake comments from someone called Bilobou Viagra or some such nonsense. Are you not plagued by that? Hi Susan–WordPress sends those comments directly to a Spam folder, which I then have to delete. I’m surprised my comment showed up, because I had trouble with the protocol. It asked for something it then wouldn’t accept! I finally gave up, assuming my comment would be deleted. It’s fun being with all you visual types! I looked at about four or five blogs yesterday, and will continue to visit during the upcoming week. 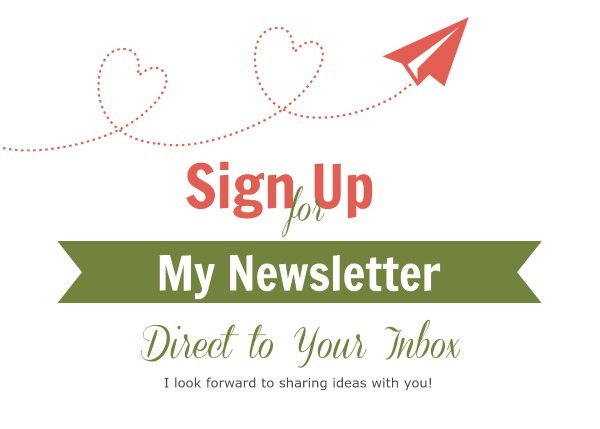 Happy blogging! 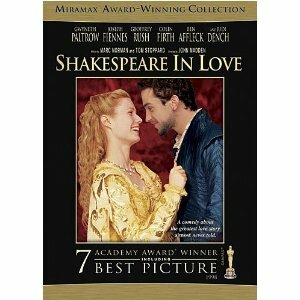 I also love Shakespeare in Love–in fact, I’m due to be getting it on NetFlix shortly so that I can enjoy it again.